Last night, in a room packed with London historians, we asked for a show of hands: how many people had heard of the Colney Hatch Asylum fire? Only one person raised a hand, and he was a member of London Fire Brigade. On 27 January 1903, 52 people, all female, lost their lives when a fire swept through the Colney Hatch Lunatic Asylum. This high death toll marks the tragedy as the worst peacetime fire in London's history since the medieval period. Yet it's rare to find a Londoner who's heard of it. Colney Hatch Asylum in New Southgate, operated by the London County Council, was an institution housing over 3,000 of the "pauper insane". The facility had been identified as at significant fire risk by authorities — many of the inmates were housed in temporary timber wings, and the complex was famous for its long corridors. In 1903, the inevitable happened. One of the timber wards caught fire and, aided by strong winds, the conflagration spread. The asylum's fire-fighting ability was limited, and the local fire authorities had to dam a stream to raise sufficient water for dousing. Some of the lunatics were burned in their beds, and the charred remains of others were found huddled together in corners, while groups of partially consumed bodies on the site of the corridors showed that many persons lost their lives and sacrificed those of others in their frantic efforts to force a passage through the flames to the main building. In the early 20th Century, psychiatric patients were held in very low regard. The same press cutting offers several insights into the views of the time. Beneath the headline "50 Lunatics Perish" runs the subheading "Many Escaped and Are Now at Large", as though these unfortunate women were dangerous criminals. It's also noted that the fire occurred in the Jewish Wing — this may have been partly for practical reasons, such as shared dietary needs, but the temptation is to suspect a prejudice. Very little further information can be found online. A Times cutting describes the disaster in less lurid tones, others are gathered here. The Wikipedia page for the institution offers just one sentence. 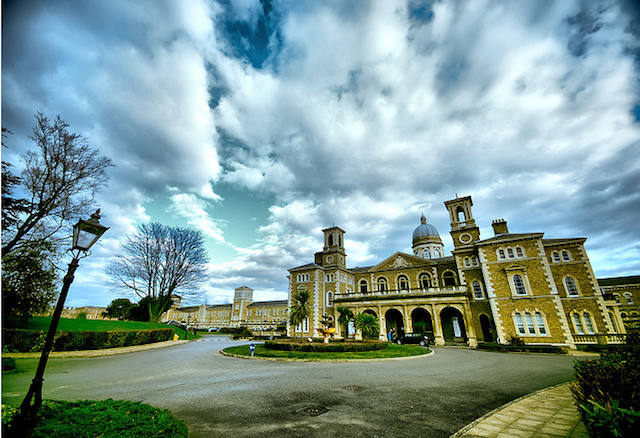 After the fire, the Colney Hatch Asylum was renamed Friern Hospital, and remained a centre for psychiatric care until closing in 1993. The main buildings are now luxury apartments, called Princess Park Manor. The developer's web site doesn't mention the tragic fire. In fact, the 'History' section makes no mention of the building's former function as an asylum. The Colney Hatch fire is truly one of London's forgotten disasters. See also: London's worst disasters mapped. Image by Tyla'75 in the Londonist Flickr pool.